One year after Dr. Goodluck Ebele Jonathan became the first sitting president to be voted out of office, more light has been shed on why one of his closest allies and former Rivers State Governor, Rotimi Amaechi, worked against him. In an interview in the current issue of The Interview magazine, Semenatari said Amaechi believed that Nigeria needed a different person as president to save the country. She told the magazine that, “Amaechi believed that Buhari had all it took to change the trajectory and envisioned that Nigeria was heading in a different direction. 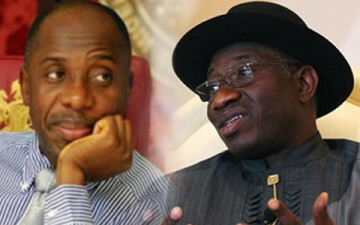 Amaechi, former member of the Peoples Democratic Party (PDP) and chairman of the Nigeria Governors’ Forum, was one of the governors who broke away from the former ruling party, leading a charge that proved fatal for Jonathan and the PDP’s electoral fortune in 2015. In the explosive encounter, Semenitari told The Inteview that Amaechi had no thought of any personal reward for doing what he did. She was answering a question about whether her own position and the double ministry assigned to Amaechi by Buhari were rewards for Amaechi’s electoral contribution.